Advanced Placement courses can provide a huge advantage to students when they hit college, but they can also be a huge drain on a high school student’s schedule and sense of balance. I’m listening to podcast 160, about all the AP and other exams in May, which has me wondering about AP courses in general. My first child will start high school in the fall, in a new school district. When we’re looking at course options do you recommend choosing AP courses to get requirements “out of the way” in subjects he doesn’t particularly enjoy, or is it better for him to focus his efforts on getting ahead in areas that do spark his interest? 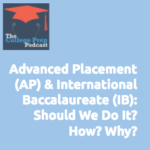 What is the difference between Advanced Placement and International Baccalaureate classes? What to ask your school when you’re an incoming freshmen to learn about how AP and IB classes work at that school. Click here to tune in and find out the answers to all these questions, and more!